Sunday is the Sight & Sound Essay competition. You don’t have to have submitted an essay to attend. The essays are entertaining and the makers can do anything they want, other than use video, for five minutes. The top essays will also form an important part of the annual spring show. Don’t miss this competition! This entry was posted in 2019, Competitons, Sight and Sound on February 28, 2019 by Darryl Robertson. Sunday 24th. 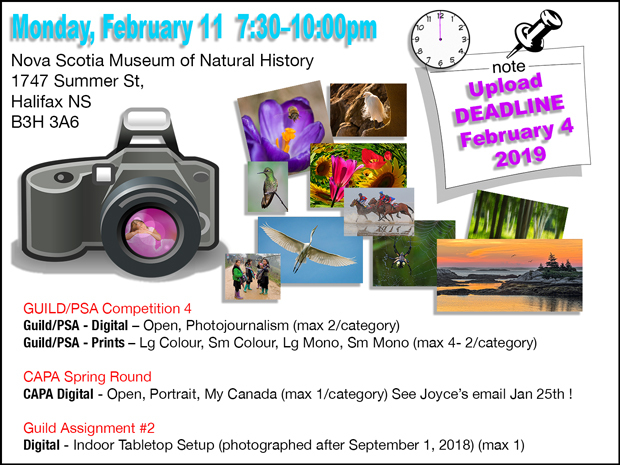 February is our annual indoor studio type portrait seminar and shoot, 7:30 PM at our usual auditorium at the Museum of Natural History, Summer St. Halifax. AGENDA : A talk on the technique of bounce flash, the lens, studio portrait lighting, and posing the model. All this will be followed by a free for all shoot. I hope to have three stations set up with studio lights etc. Bring your cameras and any other lighting equipment and reflectors that you may have. You can also bring in your own models. After all is done I would appreciate it if you were to provide JPEGs of your shoot which I can give to the models as a thank you. My models have agreed to pose for us at no cost to us or the club. I think we owe them . If these photos were to be brought in to me on a Jump drive I shall transfer them to the computer , sort them , then get them to my model friends pronto. Also please provide photos that are at least 1400 x 1050 or larger, in the past I have received photos that were so poorly sized that it was just a number of pixels on the screen and I had to discard them. Also please don’t print your name etc across the photo. One set of photos I got a few years ago had the maker’s name printed across the face—go figure. These models for coming in so you can practise your art at no cost. I have seen photos used in competitions that have done quite well indeed. Happy shooting—see you on Sunday. This entry was posted in 2019, Seminars on February 22, 2019 by Darryl Robertson. Here is your reminder that February the 4th is the upload deadline for the competition on the 11th. Can you believe it is going to be February 1st on Friday? You’d better get busy! Pick some great images for us again this time. We sure have enjoyed seeing what you’ve sent so far this year! This entry was posted in 2019, CAPA, Competitons, Guild, PSA on February 5, 2019 by Darryl Robertson.